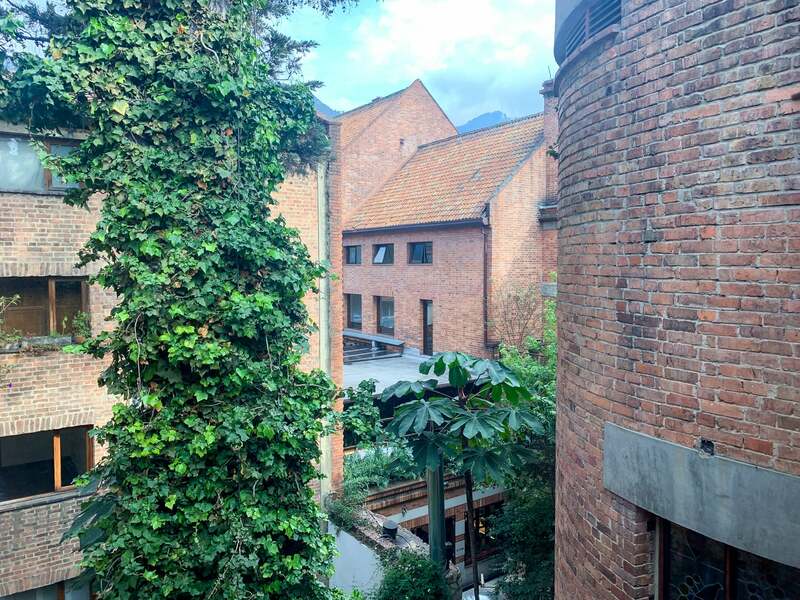 The Four Seasons Casa Medina Bogotá is one of the most unique chain hotels I’ve ever stayed at. 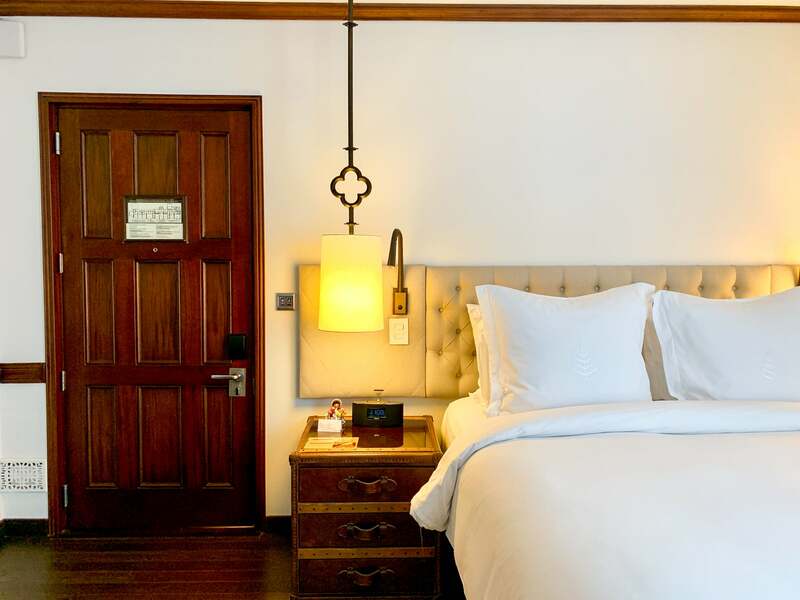 The pros: Exquisite colonial design, sumptuous beds and a cooler-than-cool hotel bar. Cons: Old, noisy plumbing and claustrophobic elevators. I’ve been interested in Bogotá, Colombia, for quite some time. As I’m a self-proclaimed urbanism nerd, the city has served as an interesting case study for me in using bold urban-planning initiatives (in Bogotá’s case, the most famous is the TransMilenio bus rapid-transit system) in hopes of improving the lives of the city’s residents. There’s still much debate surrounding the benefits of TransMilenio system in the Colombian capital, but there’s none around the fact that this city has raised its profile on the world stage to match its high-altitude location. 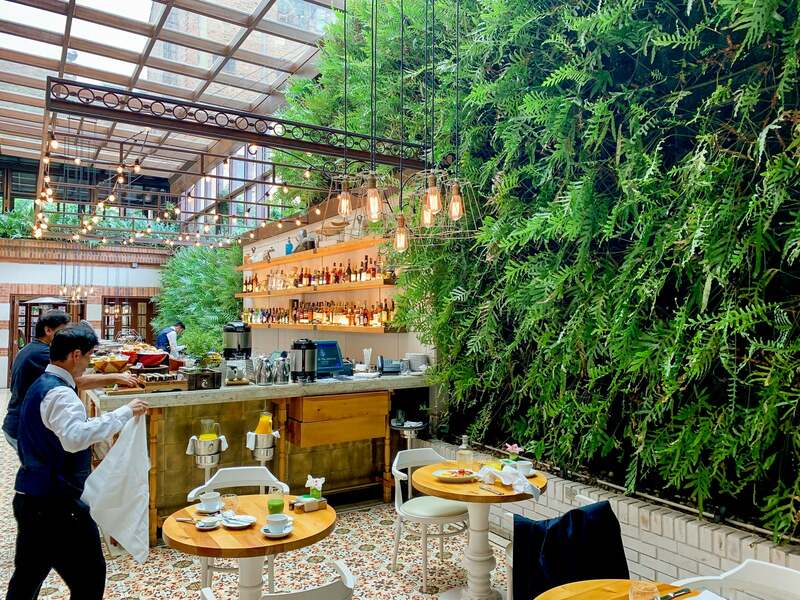 Ten to 15 years ago, you’d frankly never even think to visit Bogotá as a tourist, but since then, there’s been a proliferation of world-class cafes, shopping and, of course, hotels. 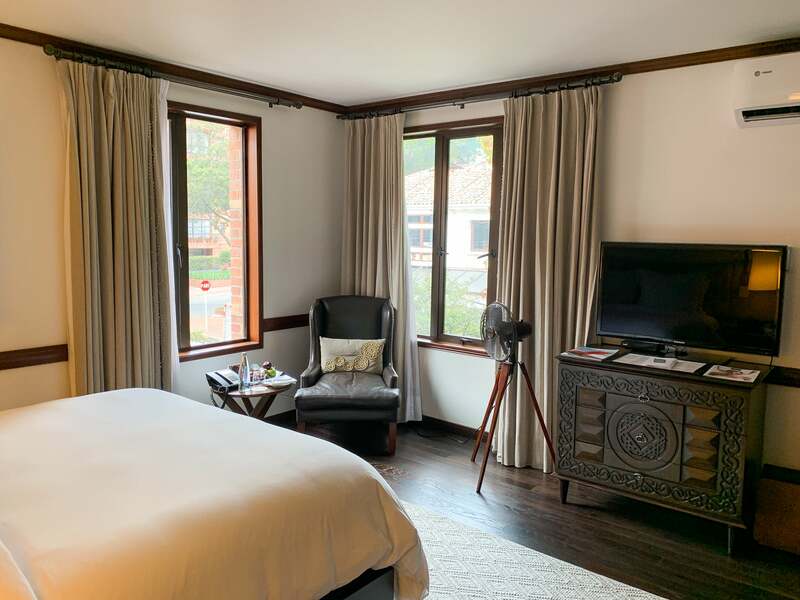 There are a number of points hotels in the city, such as the W Bogotá and the new Grand Hyatt Bogotá, the second Hyatt property to open in Colombia after the Hyatt Regency Cartagena. 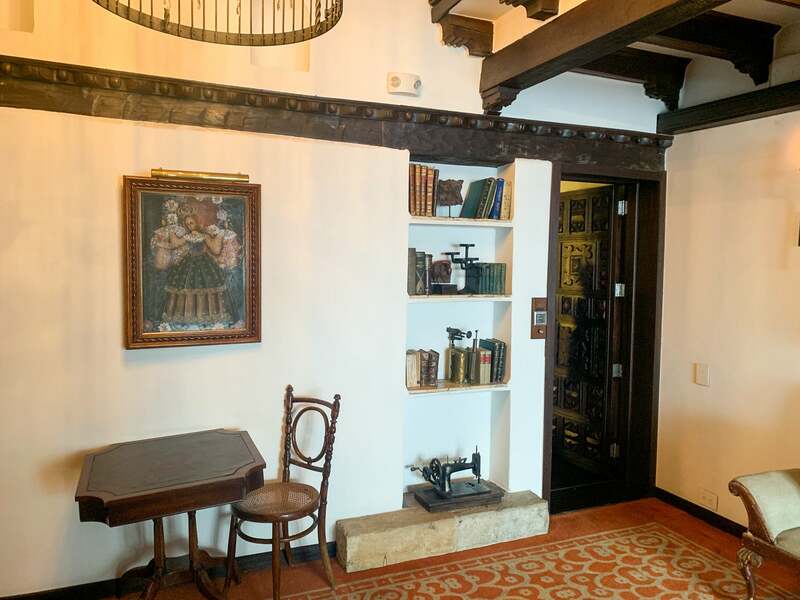 But these properties are in the business districts of the city, somewhat far from the city’s more vibrant neighborhoods and hipster-approved Candelaria district. I visited the city recently, but since I was only spending two days there, I wanted to be as close as possible to the things I wanted to see and do. 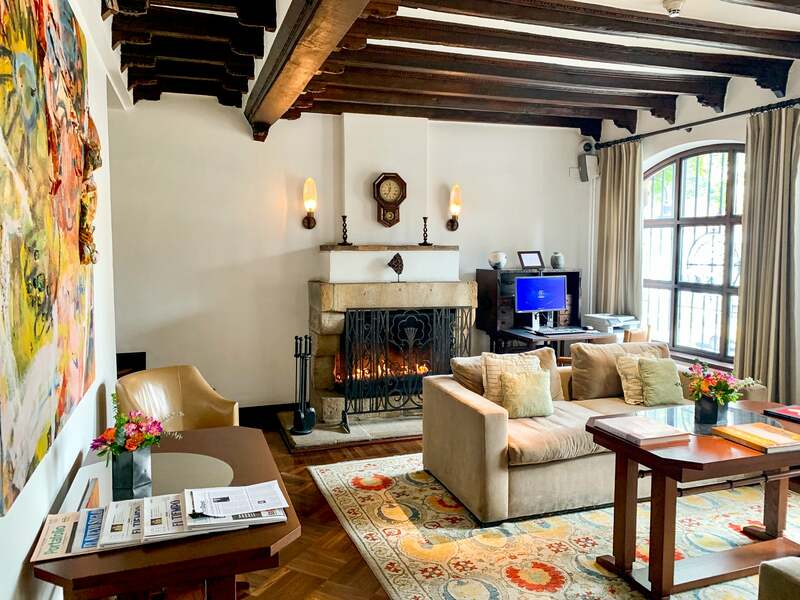 I widened my search and noticed that there are not one but two Four Seasons properties in the city, one of which — the Casa Medina — is housed in a former colonial mansion in the city’s trendy and upmarket Zona G neighborhood. Best of all, the prices were very reasonable by US standards. I booked two nights at the property and was excited for my weekend stay at such a unique place. I paid with the Platinum Card® from American Express so that I could earn 5 Amex Membership Rewards points per dollar spent. 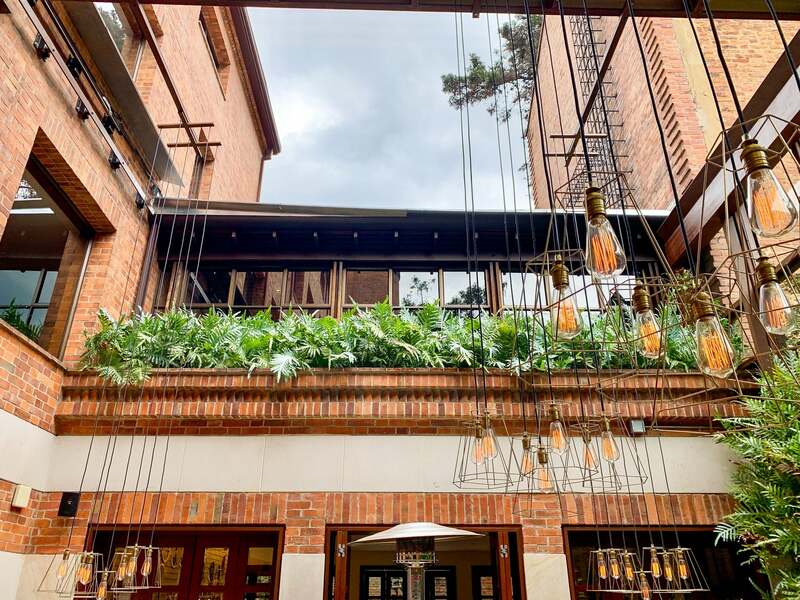 The hotel is within Bogotá’s Zona G — the “G” standing for “gourmet,” as the neighborhood is home to many of the city’s top restaurants and cafes. The hotel is on a busy thoroughfare, Carrera 7, but on Sundays one half of the street closes to cars to give pedestrians, runners, skaters and cyclists more room to get out and do their thing. I spent a couple of hours walking around the neighborhood and found it to be exceedingly pleasant, with tree-lined, quiet streets, trendy cafes and coffee shops, boxing gyms and pretty much anything you’d expect to find in a similarly sized city anywhere in the world. I realize that traveling as a solo male is much different than traveling as a solo female, but I had no qualms about my safety while walking around the hotel. Everyone I interacted with was friendly, eager to help and patient with my rusty Spanish. Just as with every large city around the world, you should exercise prudence and caution when out and about, but in general I felt totally comfortable walking around the city with my backpack. One specific suggestion for Bogotá, though, is to not hail cabs off the street — drivers are notorious for taking roundabout ways and grossly overcharging for rides. I used Uber when I had to go farther distances. Technically, Uber is not legal in Colombia, but there’s seemingly an understanding in place, as the service worked perfectly fine, though wait times were a little longer than what you’d experience in a large US city. It took about 40 minutes with some traffic to get from Bogotá-El Dorado International Airport (BOG) to the hotel. Uber pickups at airports in countries where it’s illegal are always an adventure, so I decided to take a cab. Instead of getting in the taxi rank, though, I stopped by the Imperial Taxi stand inside the airport and paid $22 for a ride in a private van directly to the hotel. Airport taxis are considered a safer bet than hailing them off the street, so I’m sure it would have been fine, but I hadn’t taken any cash out yet and had just gotten off a 10-hour flight from Europe, so this was the best option. 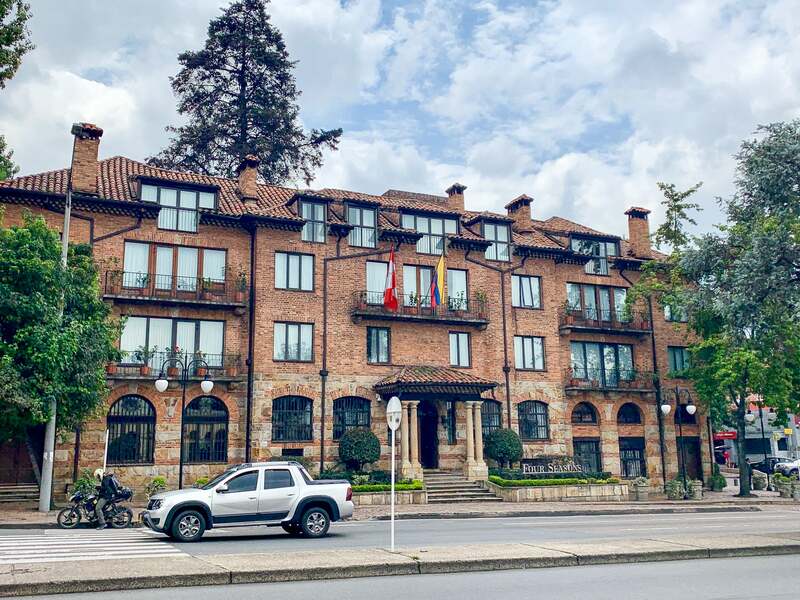 The process was incredibly easy, and I had a friendly driver — I would recommend the Imperial taxis to anyone visiting Bogotá. I arrived at the Four Seasons around 8pm after a long journey from Europe and was immediately captivated by the uniqueness of this property. 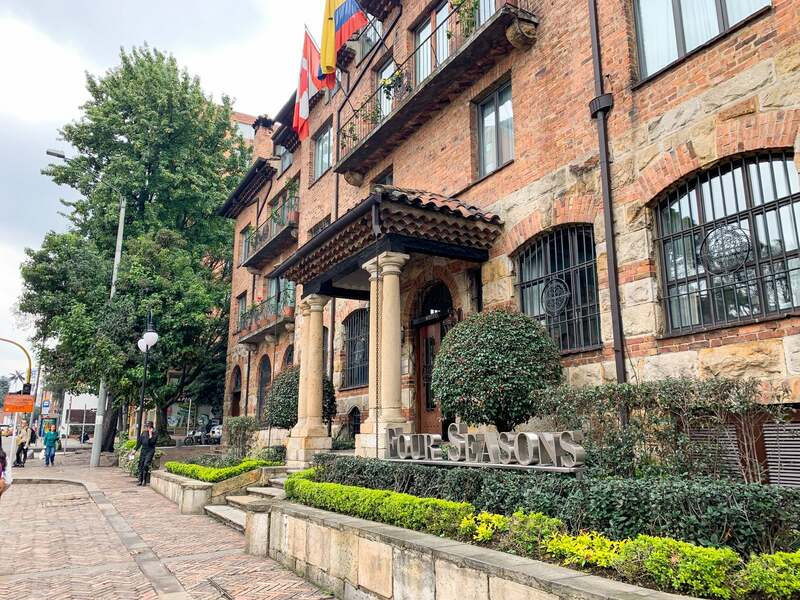 I Immediately felt like I’d stepped into another time — the lobby was filled with rich, ornately carved dark woods, beautiful but approachable furniture and fireplaces — the perfect touch for chilly, drizzly Bogotá. The hallways were filled with works of art that made me feel as if I were in a museum. 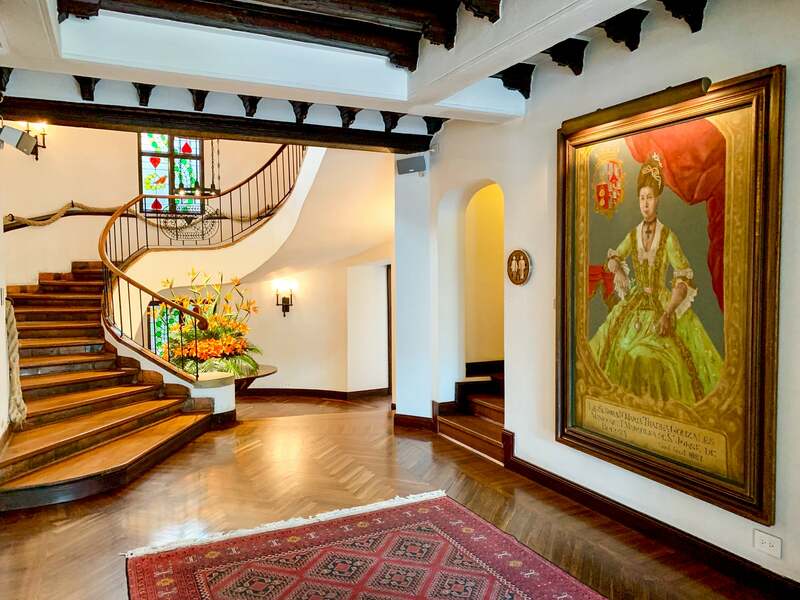 The wood-and-wrought-iron staircase spiraled elegantly to the main floor and was highlighted with a stunning arrangement of fresh flowers that I could actually smell. 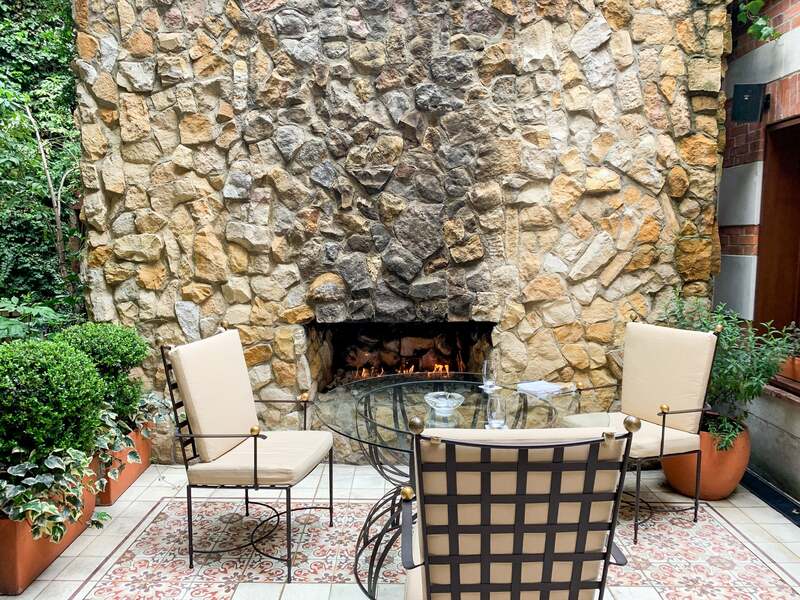 The check-in agent explained that my FHR benefit at this property was a $100 spa credit, but there were no appointments that fit into my hectic and brief weekend in the city. So, for this particular stay, the best FHR perks were the free breakfast and the 4pm checkout, because my flight wasn’t until 9:30pm on Sunday. I was assigned a room on the third floor in the more modern wing of the hotel, though it didn’t feel markedly different from the original wing. 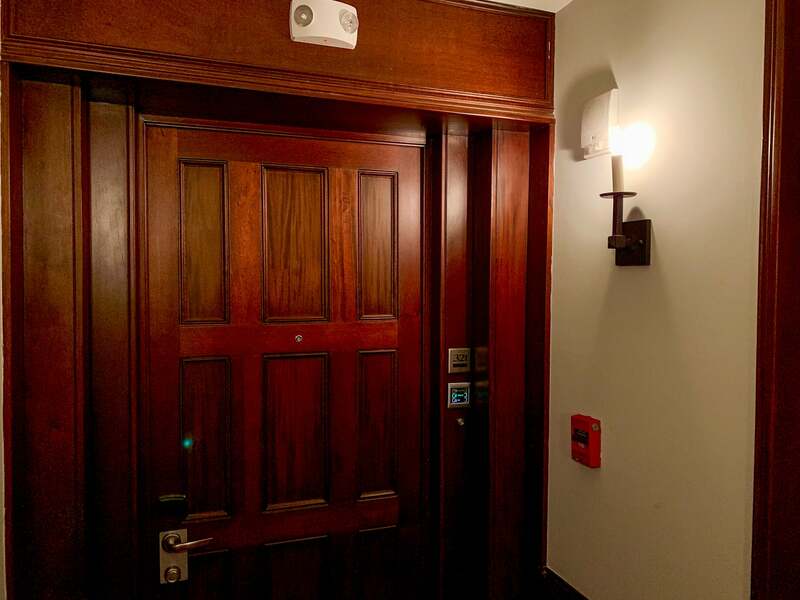 As I mentioned earlier, each and every room in the property is unique — not two are the same. 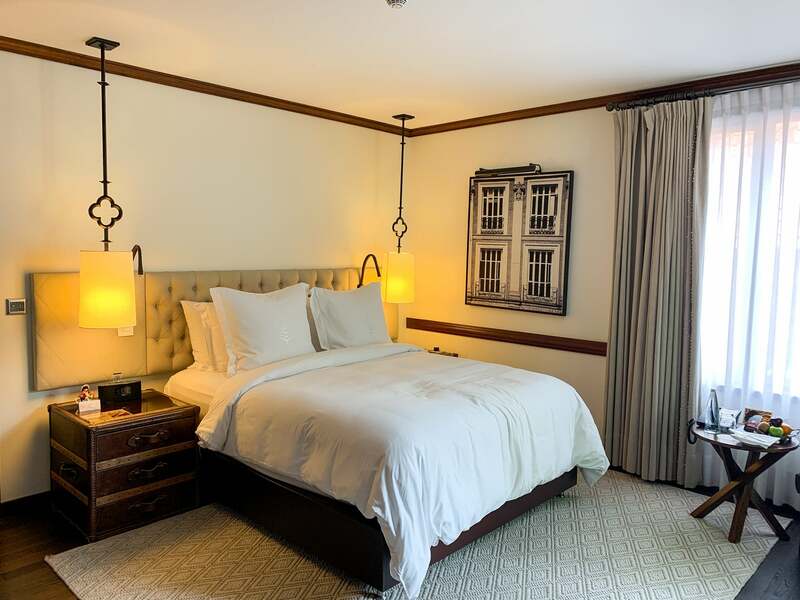 But you can expect rich woods, and plenty of colonial touches such as wrought iron and modern amenities that you would expect from a chain like the Four Seasons. Mine was a corner room, meaning I got two large windows that let in plenty of natural light. But, since the property was right in the middle of a busy neighborhood, there wasn’t a ton of privacy when I left the curtains open — one of my windows looked directly into a coffee shop. I unintentionally had a brief stare down with a customer in that coffee shop. After many awkward seconds, she looked away, but I proceeded to close the sheer curtains so that I could avoid those kinds of interactions. The rich wood floors and trim, intricately carved wooden furniture and wrought-iron pendant lights gave me a taste of a bygone era, but the room was thoroughly modern with electronic “Do Not Disturb” and “Make Up Room” controls, a flat-screen HDTV, high-speed Wi-Fi and, perhaps most importantly, air conditioning! 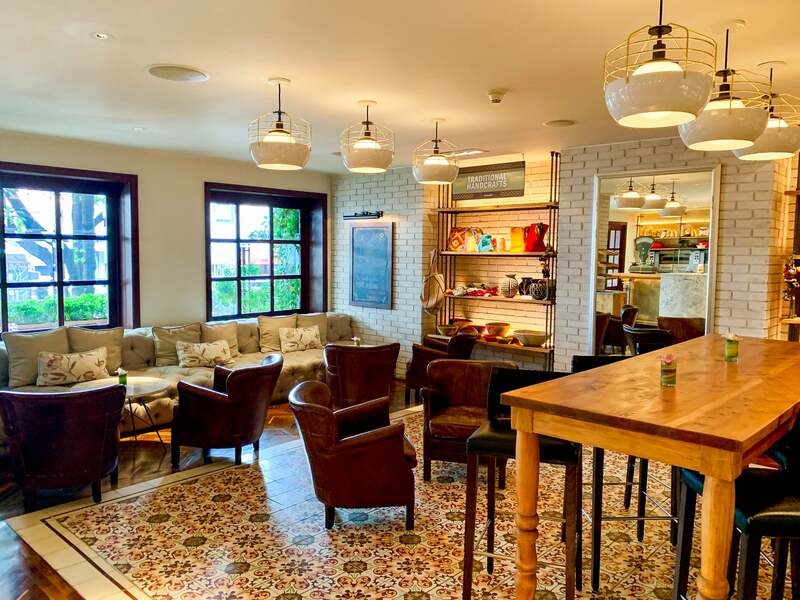 One thing I noticed was that, though there was a fantastic nook with a comfortable and perfectly worn leather chair, there was really no space for a desk or any sort of work space. Still, this didn’t feel like the sort of property where people would be working much. 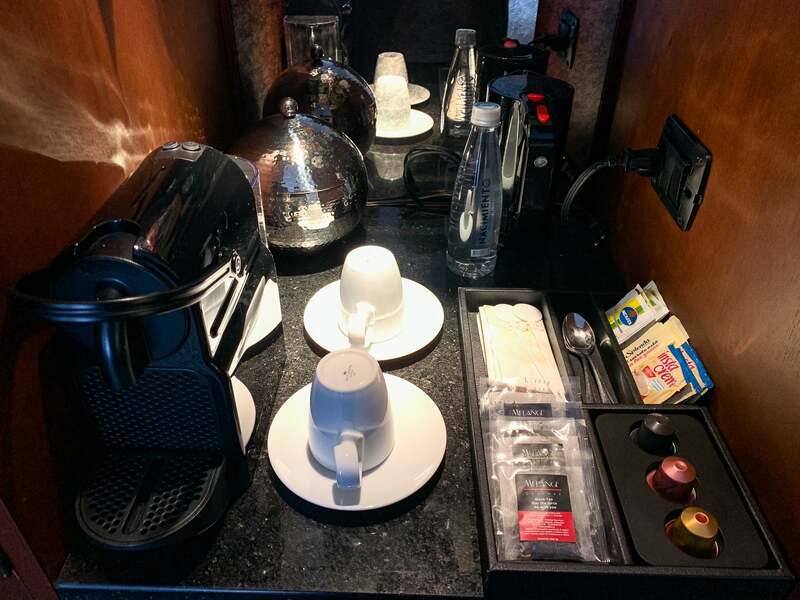 For all the coffee drinkers out there, the room had a Nespresso machine with complimentary pods. And there were free water bottles left throughout the room — these were replaced regularly when housekeeping came to make up the room initially and then again for turndown service. 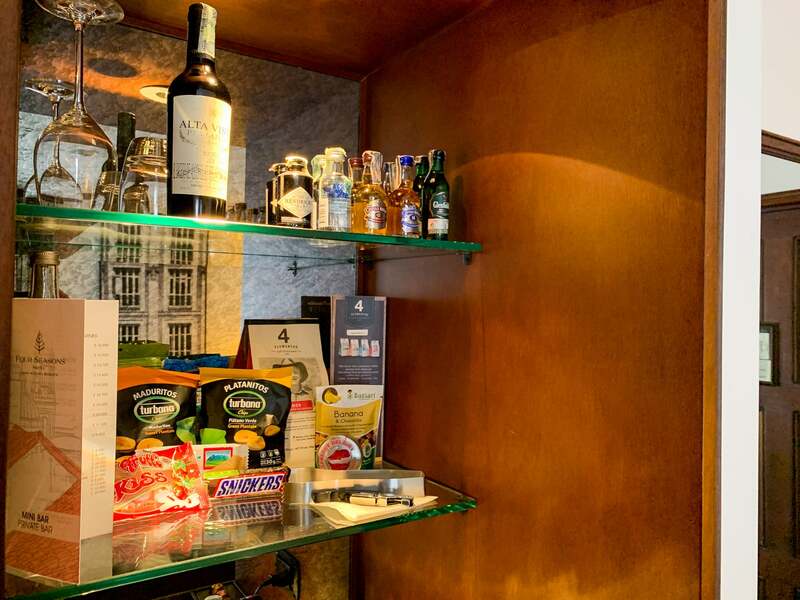 The closet and minibar were next to each other, and I was shocked that the prices weren’t totally ridiculous — a Diet Coke was about $5, much less than what you’d pay at a Four Seasons in the US. The bathroom was a good size and was pretty much all gray marble. The single vanity was a little cramped, though. I thought plantation shutters were the right move in the bathroom, as the window looked right out into the adjacent buildings. One noticeable “feature” of such an old building: The plumbing, specifically in the shower, made a lot of weird noises. 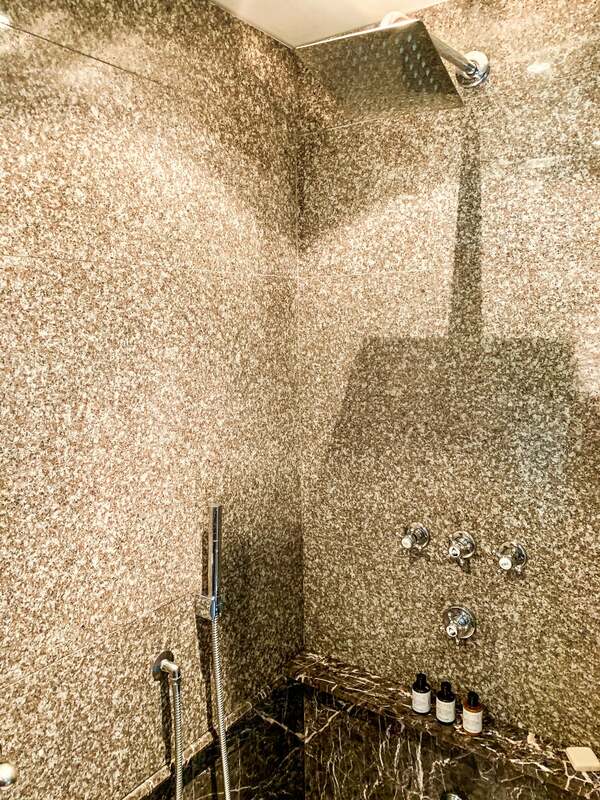 It sounded like someone was trapped behind the shower head and was banging on the marble trying to escape. Luckily, though, I didn’t have a real life “Cask of Amontillado” situation on my hands. 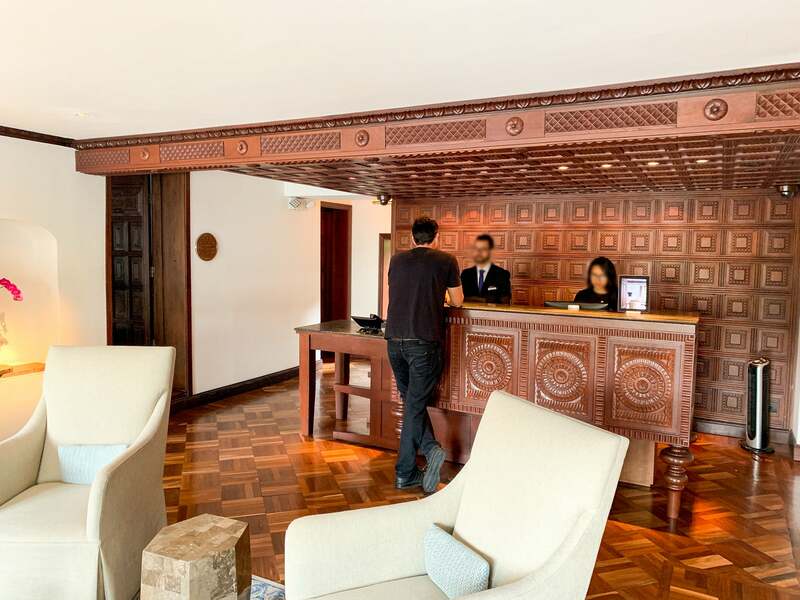 While the hotel featured exquisite colonial design throughout, its on-property restaurant called Castañyoles went fully modern and trendy, and they did a fantastic job. This space was truly exceptional, with a retractable glass roof, a stunning courtyard, beautiful floor tiling, uber-cool filament bulb lighting and both indoor and outdoor fireplaces. The breakfast buffet was extensive and beautifully presented. 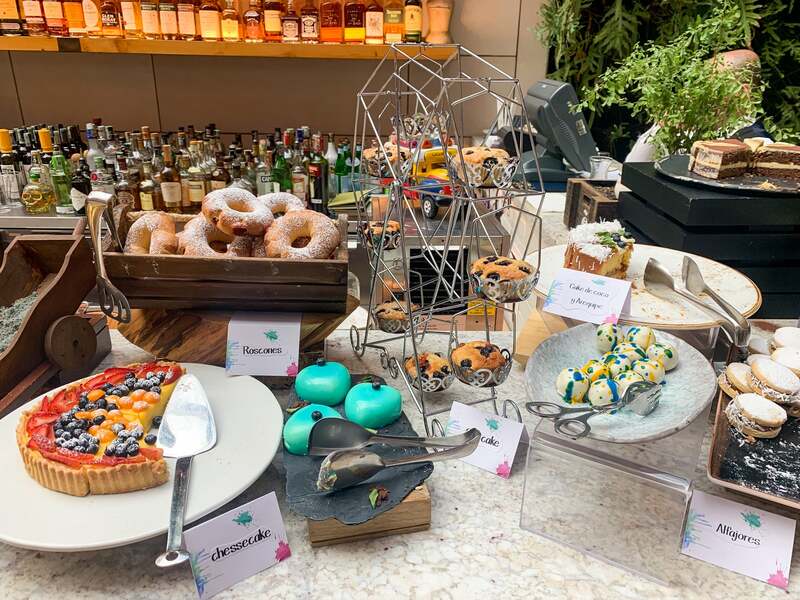 In fact, with all of the sweets (looking at you, alfajores) it was downright extravagant — and all free for yours truly! 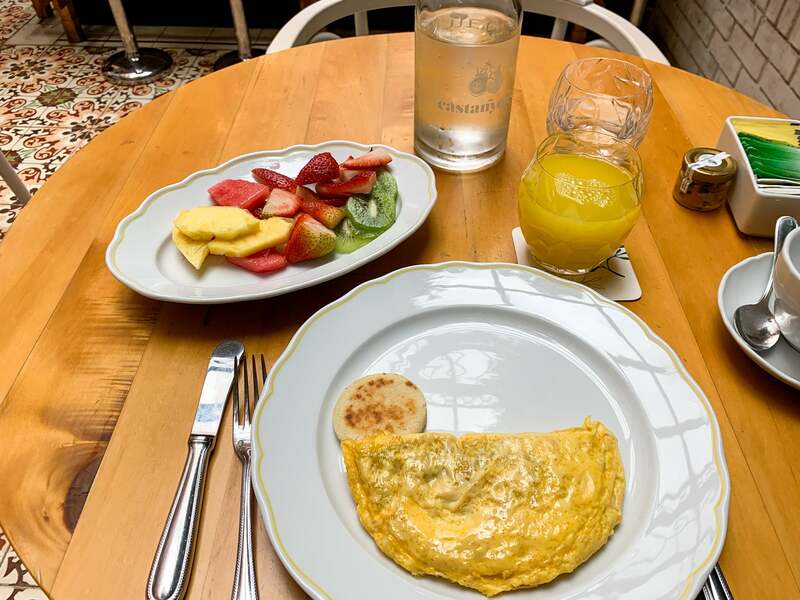 I was deeply disappointed with myself because for some reason I just wasn’t that hungry, and I was hoping to catch a city tour, so I was pressed for time and thus didn’t indulge as much as I would have liked to. But I ordered an omelet with extremely spicy peppers, cheese, ham, spinach onions and more. Combined with a large plate of fresh fruit and OJ, it was the perfect way to start my day. After the breakfast and lunch seatings, the area turned into an impossibly cool bar. The experience was made even better by the fantastic bartender, Carlos, who was passionate about his craft and helped educate me on the art of creating cocktails, local Colombian spirits and more. It seemed that in addition to hotel guests, in-the-know locals came in for a drink or two before a night out on the town. 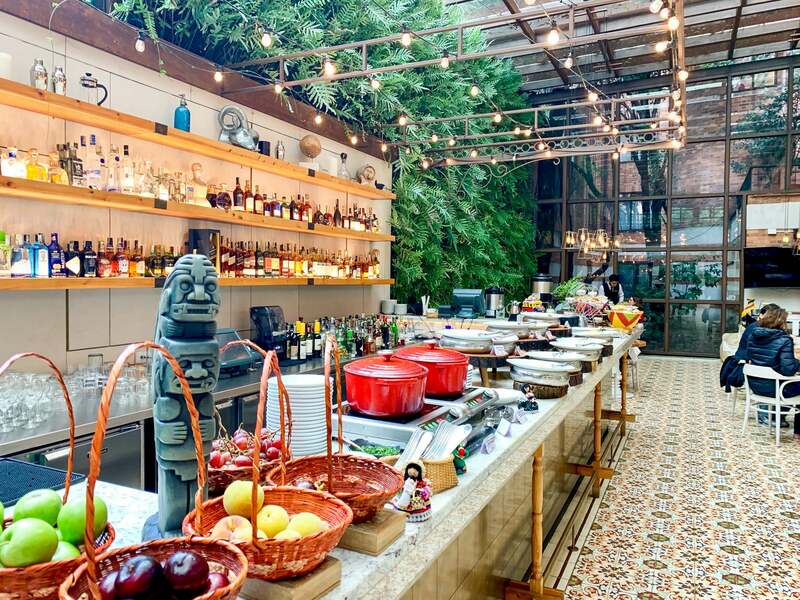 The hybrid indoor/outdoor space and beautifully lush design made for a bar and restaurant that I won’t soon forget. Across the hall was a more casual spot to have a snack or sip a Colombian coffee, though it was still technically part of Castañyoles. 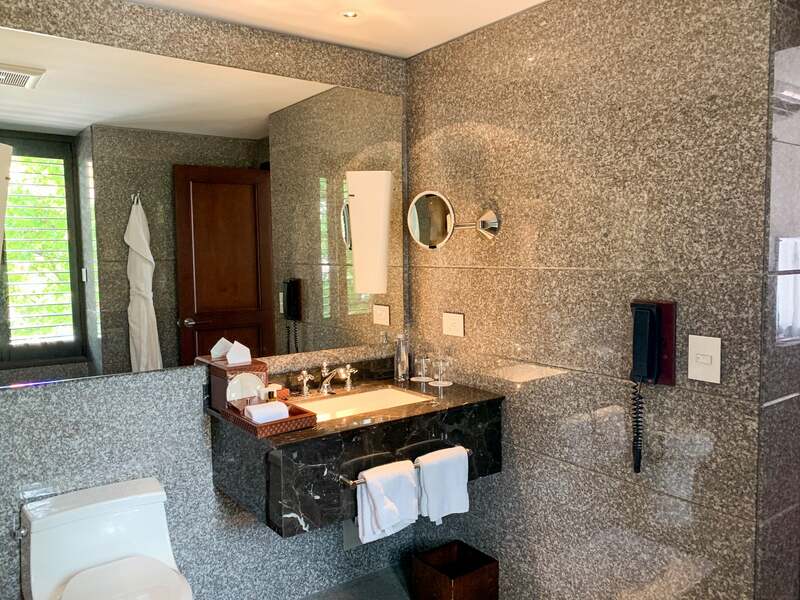 The Casa Medina is a small city property, so there weren’t many amenities on offer, the main one being the spa. Though I was entitled to $100 toward a treatment, I just couldn’t make it work on such a quick weekend. I did go down to the basement of the hotel to check it out, though, and heard from a guest in the elevator that the treatments were more than worth it. 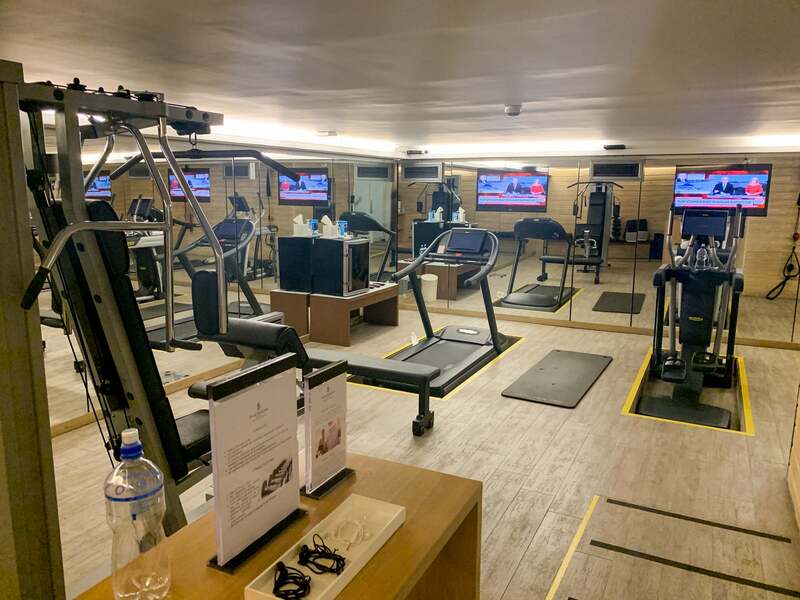 The hotel’s small gym, open 24/7, was within the spa. There was no pool, but Bogotá isn’t really a place where you’d want to spend hours chilling by a pool, anyway. I’d consider the hotel’s greatest amenity to be all of its intimate spaces where you could sit down and take in the uniqueness of this property. Can’t you just see the Spanish governor sitting here and working on his correspondence back in colonial days? The hotel had an inner courtyard, too, that had a little bit of seating for guests. One night, I came back after nightfall and saw a group of people standing around the fireplace having cocktails — it looked like quite a nice time. Needless to say, I was sad when I had to check out of the Four Seasons Casa Medina. Service on the property was excellent — all the staff members were helpful and friendly, and they never made me feel silly for stumbling over words when speaking to them in Spanish. 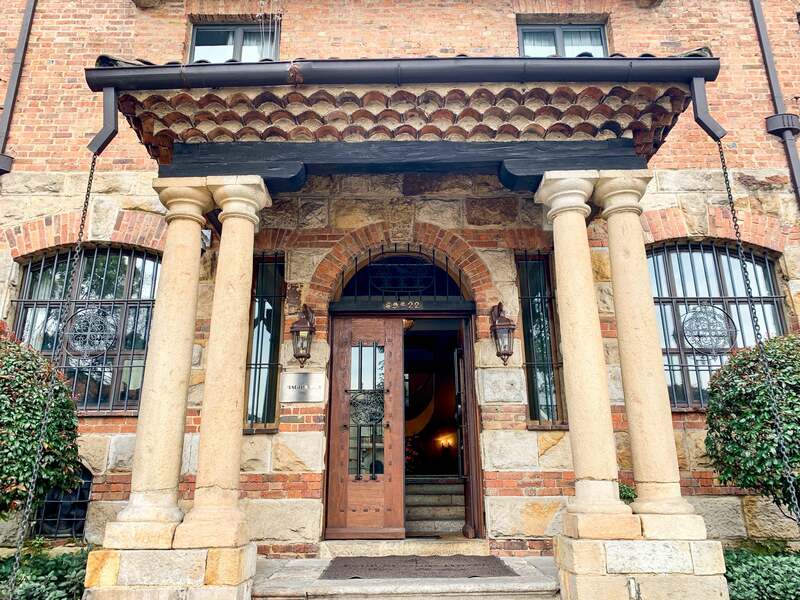 The chain did an incredible job of maintaining the historical integrity of the building while creating a modern, luxurious hotel for discerning travelers. 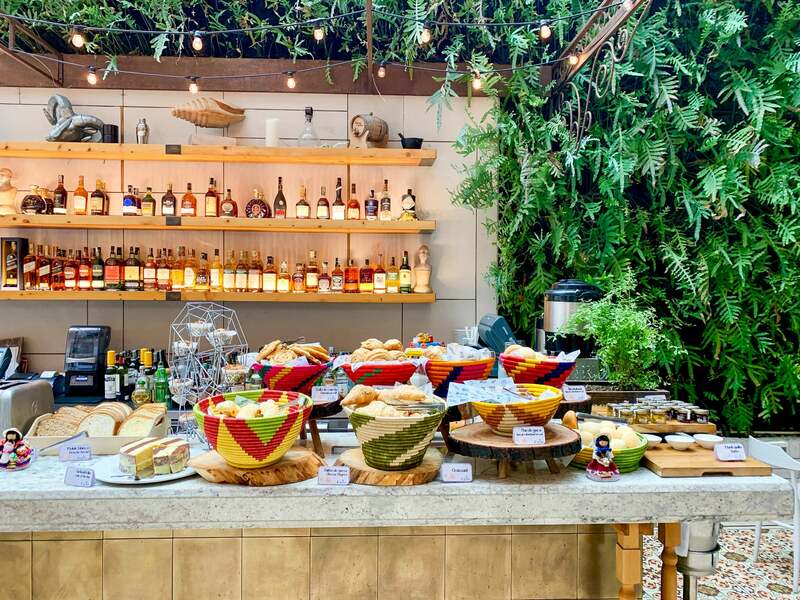 Even with all of its historical charm and character, perhaps the standout feature of the hotel is its ultra-cool and trendy restaurant-bar combination. It’s a place that shows off all the global ambitions that Colombia has. I barely scratched the surface of this beautiful country, so when I return — hopefully sooner rather than later — I’ll make a point to book another stay at this one-of-a-kind property. 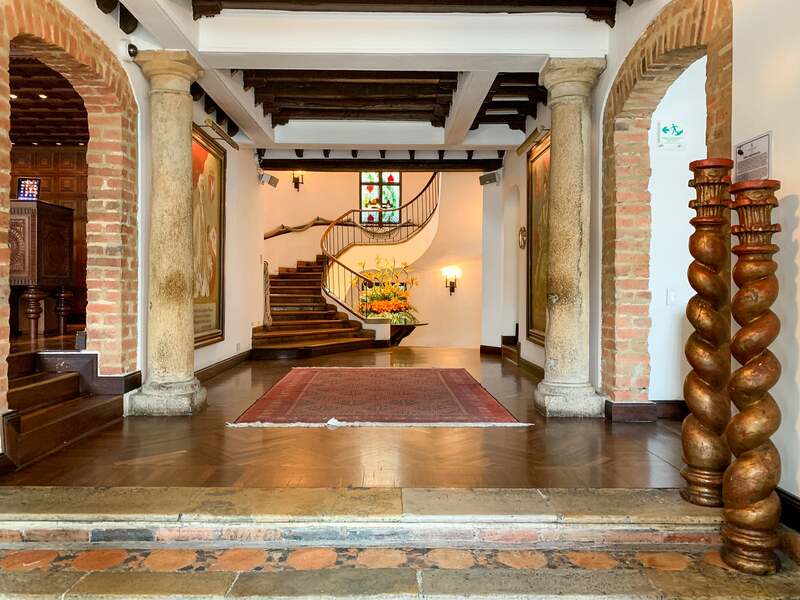 And for anyone that’s looking for a wholly unique retreat in the middle of one of the biggest cities in the Americas, I can’t recommend this property enough.